If there were such thing as a "young person's classical violinist," well, Hilary Hahn would definitely be that! In a time where the violin is getting more and more popular, by being used in more and more kinds of music, and yet less and less refined in its traditional sense, Hilary has managed to be able to combine both of those things. Firmly planted in the classical world, she wanders blissfully along the pathways of other artists and genres when the opportunity arises, never really leaving her ties to the classical world, but yet never really trying to be anything other than what she is when playing with others. In fact, it is this genuineness of spirit that has propelled Hilary along. Yes, she is a phenomenal musician. Her tone and technique are, quite possibly, unmatched and unrivaled. But that can only get you so far. It is the musician that makes the music, and that means that the audience has to be able to relate in some way to the person playing. We need to feel that, even though this person is creating something that is clearly well beyond anything we could ever do, that they are still human and, therefore, capable of a mistake here and there. Hilary began playing violin in a Suzuki program at the Peabody Institute just before her 4th birthday. It wasn't long, six years actually, before she was accepted into the Curtis Institute of Music, where she studied with Jascha Brodsky. By the age of 11, she was making her orchestral debut soloing with the Baltimore Symphony Orchestra, followed by appearances with the Philadelphia, Cleveland, and Pittsburgh Symphonies, as well as the New York Philharmonic. In another few years, by the time she was 15, Hilary made her international debut in Germany, playing the Beethoven Violin Concerto with Lorin Maazel and the Bavarian Radio Symphony Orchestra. 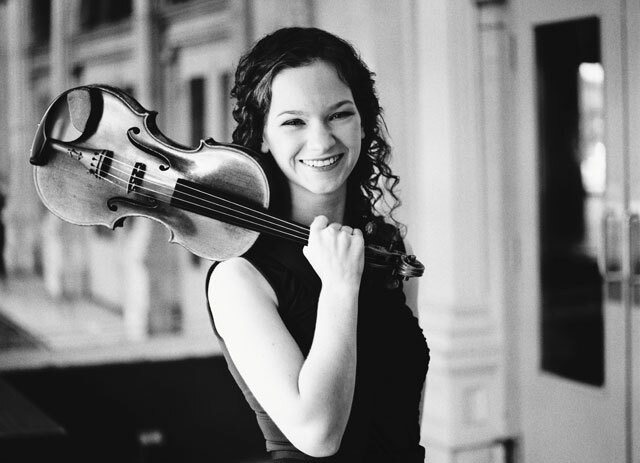 At 16, she signed with Sony Records, where she proceeded to record her album "Hilary Hahn Plays Bach," which, for some people, is the quintessential recording of the Bach Sonatas and Partitas for violin. Actually, when it comes to Bach, Hilary says she has played Bach every day since she was 8 years old! It really kind of explains a lot. 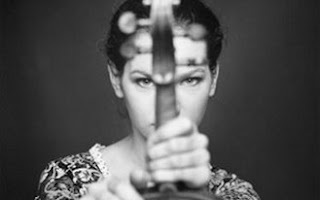 A violinist who can truly understand and play unaccompanied Bach cleanly, musically, and proficiently, can pretty much do anything else. Hilary has spent some of her off-season time (if there is such a thing!) playing with Josh Ritter. She has also been part of Tom Brousseau's new album, "Grand Forks." She doesn't really consider herself to be a "cross-over" artist, though. She merely thinks that playing music is what she does, and different genres and styles are just part and parcel of the whole package. Oh, and if you've seen the movie "The Village," that violin solo that you hear throughout the film? Well, that's Ms. Hahn. In the end, Ms. Hahn has figured out how to be a great performer and a great personality as well. Take a look at her website, HilaryHahn.com, and her Twitter site (which is actually her violin case's Twitter site!). With everything she has going on, she still finds time to let the rest of us in on what is going on! Hilary plays on an 1864 J.B. Vuillaume violin. 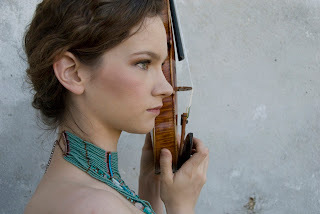 I am in total awe of Hilary Hahn. Such a devoted fan. Love how Hilary plays and her humble, elegant personality. As a Violin student myself, Hilary is the pinnacle. The Ahn Trio. Beauty & Talent.